Johannesburg - The Bayethe Music Production and Promotion company (A division of Bayethe Media), has finally secured a space in the December trending arts news through its award winning poet Gugulethu Ndlovu. It is reported that the electrifying Ndlovu almost compelled the Mpumalanga audience to run berserk after delivering a top drawer poem based on the historic Marikana incident, on a chilly Saturday the 10th of December 2016 at Nelspruit, Mpumalanga Province. The event running under the theme: 'Arts for social justice’ is organised by South Africa’s Department of Arts and Culture, in collaboration with Khwera Arts . The competition had two main categories namely: poetry and drama, both focusing on human rights. 15 poets participated on the day,however from a citizen perspective, one would say 'out of that 15, we had only one hope for "igugu lethu" (our pride) and that one hope had no choice beside taking the odd number one after adjudication process. Off which it just happened in that fashion. On the drama side there were six groups. The competition only rewarded a price money of R8000.00 and 2000.00 to the best of best for drama and poetry respectively. The two categories happened to be the only stage menu available on the day for theatre lovers. "I was happy after winning and I know that from now I am under pressure because after winning people expect the best from you always, so now I have to work harder," said Ndlovu-the 20-year-old Johannesburg born Zimbabwean offspring. When asked about the source of inspiration and poetic muse, Ndlovu said she make sure that she always stays updated on the current affairs via the media. So from there she derives sense out of even the senseless scenes. "It is a male dominated industry but for me that is never a problem or challenge,’’ Ndlovu said concerning the gender imbalances of the arts industry, particularly in poetry. Reflecting on his sentiments on the poet’s award the Bayethe Media C.E.O Mxolisi Ncube said: "I have always believed in Gugu’s abilities. I have always believed she is a bomb and that sooner rather than later, she will start winning awards, but I must admit I didn’t expect anything this soon. She surprised me. She has been like that- a student who skips grades because of her intelligence. I am happy for her. I was very elated that one of our artists has put us on the map. We are all happy at Bayethe Music." When asked about what to expect next year, Ncube further said: "Fans should expect at least two promotional tracks from her, which will introduce her to the world of music scene. I won’t say more about the tracks right now, but I strongly believe they will make an impact. Our aim is to see her get at least one musical nomination next year. We wish that for all our artists and we know she is one of those artists who are capable of being world beaters." Responding to the question of low number of females in poetry, Ncube said: "the low number of females in poetry can be a disadvantage in that it means there is very little competition and may cause people to relax, but Gugu is not that kind of person that relaxes and to her, its not about female or male poets. To her it’s about talking stories and reflecting the world and Pan-African society through poetry. To her, a poet is a poet whether male or female. To her, poetry has no gender , but only stories and more stories to tell." Edifying on what his boss said, the head of Bayethe Promotions Mcasiseli Gwaza further elaborated on the tough journey he had with his artist, travelling all the way from Johannesburg to Mpumalanga leaving no one hoping for good. "We were late despite the cooperation of the taxi driver, the competition started at 9am and by then we were still half way the route, when we arrived I fast approached the MC who told me that there were only two poets left including the one on set, before we could even find our seats the poet was done. She could not even finish her backstage preparations properly as she was immediately called as the last poet. She was sweating, down and disappointed but I used my skill to comfort him. I even gave her a special hug to give her some strength and the moment she set her foot on stage everything changed. The audience went on silence, she took command and the rest is history." Apart from the Gugu Bayethe has other artist signed under them that include poets like Nxayezwe khumalo and Bongani Mncube , Noma Moyo (gospel artist) and Izwi lesiphelo (gospel choir). "After her performance we went for a break as the programme was now transforming to drama, we did not know what to expect as we did not have a chance to see the other preceding poets, so when the results were announced, it took us by surprise and here we are today , true to our slogan, we are indeed refining rough diamonds," added Gwaza. The poem itself dwells on the August 16 2012 Marikana incident whereby, 34 people, mostly employed by Lonmin platinum mines, were killed after brutal police opened fire on striking miners. The poem therefore evokes the emotions and mourns the deceased. The ills of the coalition government are inherently exposed, and the poem depicts a rainbow nation trapped in a net of political games with unregistered referees who leave no room for serious thinkers as innocent and defenceless lives perish at the hands of the very armed authorities who are supposed to be the stalwart defenders of human rights. From stanza to stanza the beating heart of democracy will increase its tempo , rewind to even record the pre-colonial era, take you back to apartheid ,then the dawn of "Nkosi sikelela i Africa" and finally leave you with more questions than answers, questions that are also resembled in the question-mark shaped map of Africa. 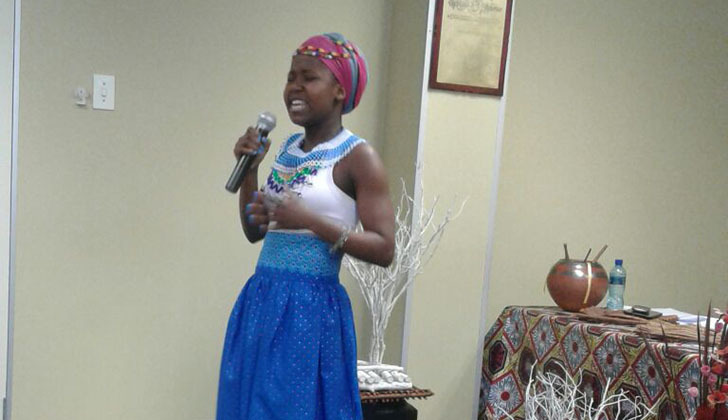 Apparently Gugu-The poet, has rubbed shoulders with the greatest graduates from the university of wisdom like Mzwakhe Mbuli who had no choice but to help her record one of her poem entitled "Black and Cursed," a poem that problematises race, social fallacies and dogmas. Arts journalists and analysts will at some point have to agree to the assertion that Gugu is one of the upcoming 'unlimited editions’ as she does not recognise gender, nationality, ethnicity, race, class or even genre in her approach. Small in stature but her poems are just but philosophically too long, she is a girl with a mother’s heart. With the Zimbabwean poetry being largely a choir of male voices, the stage wizard and other female artists raising hands in diaspora are yet to sway the systems. 34 men depart from this world!